During the ‘Free Iran’ rally in Paris on July 1, the mood was festive and clearing upbeat, as speakers discussed the movement of MEK members from Iraq to Albania. But many of the speakers and delegations also spoke of the real possibility of regime change in Iran, as they noted major changes on the international scene. Speaker after speaker from the United States pointed to the new policies of the Trump administration, while others acknowledged the Obama administration for its efforts to remove the MEK from the terrorist list. 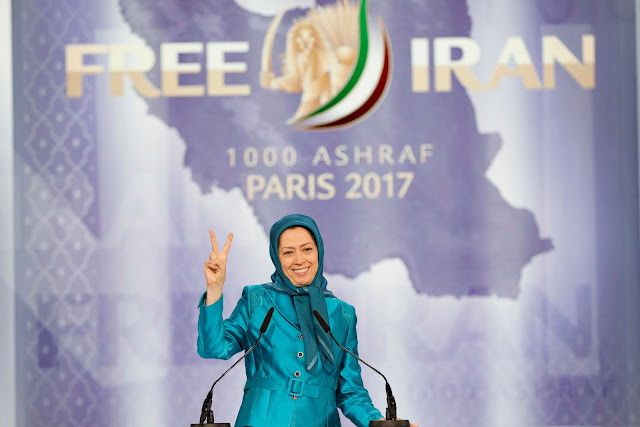 Still, the highlight of the event was the keynote address by Maryam Rajavi, the National Council of Resistance of Iran (NCRI) President-elect. She noted that there was an alternative to the current regime and its extremism. “Since last July, the Iranian Resistance has hoisted the banner of seeking justice for the victims of the massacre of political prisoners 29 years ago, turning it into the main focus of political discourse in Iran today,” said Rajavi. She noted that in the recent Iranian elections, which many speakers called a “sham”, that the slogan of the resistance was “No to the executioner, no to the charlatan”. It was a slogan that was widely embraced by the Iranian people, and referenced the attempt by Khamenei to elect Raisi, a member of the death commission in the 1988 massacre. Rajavi said there is alternative to the Iranian regime and it is the Iranian resistance. “It is relying on political prisoners, who reaffirmed their support recently for this gathering from the depth of their cells and dungeons. It is relying on women, workers, teachers, professionals, and selfless youths. It is relying on their unsparing love and generous support, those who barrow money and sell their houses and properties to help keep this Resistance independent, strong, and solidified,” said Rajavi. She noted that the Resistance has continued to fight for freedom and stood by what it has said and promised. “The Iranian nation is proud to have created a democratic alternative through resistance and great suffering and sacrifice. This decisive asset,…did not exist at the time of the Shah,” said Rajavi. She acknowledged that this left a vacuum that allowed the regime to grow and take root. As part of her discussion of the Resistance, she acknowledged the contributions of Massoud Rajavi, who has been a leader in the Resistance, but also active in encouraging those in Camp Liberty to keep fighting and maintain the struggle for freedom.